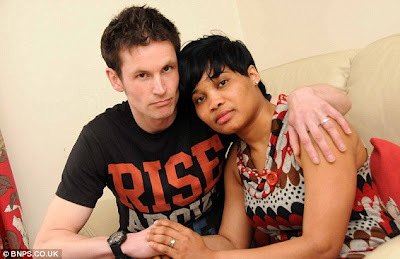 A 19 year old girl, May Brown who claimed to have witnessed her father's death in Nigeria fled to the UK to seek asylum. 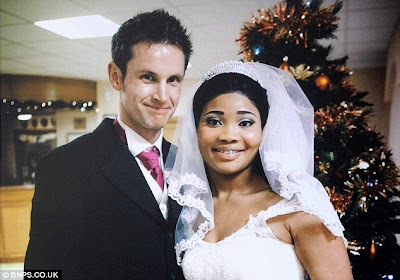 She married a British man believing that she'll be granted British citizenship but British immigration denied her citizenship with the believe that her marriage is sham, as in paper marriage. The girl, in what seems to be a desperate move, overdose a few days to getting deported to Nigeria and is now battling for her life in a hospital. Meanwhile, she left a suicide note before she attempted to take her life. 'I am deeply sorry that I had to go this way, without even saying goodbye. Before she took the overdose, May had said she feared her abusers would kill her if she returned to Nigeria because she witnessed her father's death. Her husband, Mr. Brown and her mother-in-law totally believe it's a genuine case and she's so bitter that she attempted to take her life. They're blaming the UK Border Agency for the treatment of his wife. Anyways, I don't know whether or not she's genuine but seriously, what's so bad about coming back to Nigeria and I beg, after looking at that picture above, does the girl look like someone that's being hunted in Nigeria? Maybe she should start be telling her father's name. Do you think she's genuine in her claims? This one,19, then as a mother, I am a virgin. Naija people and their lies for papers. They should deport her jare. lol! she get brain ooo, Na another strategy be that. Now the question is are they still going to deport her, or leave her alone? hehe sharp babe sha no let make dem take u go mortuary.